A classic example of an illusion involving near and far away objects so that the larger distant object appears smaller than the object in the foreground. 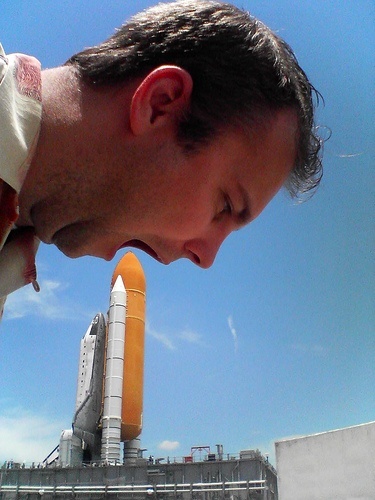 In this case the photographer is pictured with his mouth open wide ready to consume the space shuttle which looks a bit like a hot dog in this context. That's clever! I wonder what the space shuttle tastes like. i like doing these!!! !they're soooo cute!!! Somebodys Trying To Come Out Of The Closet In His Own Way.. YA i dont realy see it in this one!!!!! Actually, there was a top secret "Giant Man" that we obtained back in '97 This might be real a real photo.